This tutorial introduces a technique of batch rendering a sequence of frames without using Tractor or the batch render menu. It is assumed the reader has followed the suggestions in the tutorial RfM 22: Customizing and has downloaded and installed the customization scripts. Unlike Tractor and RfM's batch render the technique shown here enables rif filters, written in python and compiled C++ RifPlugins to be applied to a sequence of rib files. 1 Set the Maya project directory. 2 Save the Maya scene. 1 for rib generation ON ie. render a "fresh" rib sequence. 0 for rib generation OFF ie. rerender an existing rib sequence. Part of a typical (MacOSX) script is shown below. "PATH_TO_PRMAN_EXE" -cwd "PATH_TO_CURRENT_PROJECT_DIR" -t:all -progress "PATH_TO_CURRENT_PROJECT_RIBS_DIR/perspShape.0001.rib"
"PATH_TO_PRMAN_EXE" -cwd "PATH_TO_CURRENT_PROJECT_DIR" -t:all -progress "PATH_TO_CURRENT_PROJECT_RIBS_DIR/perspShape.0002.rib"
"PATH_TO_PRMAN_EXE" -cwd "PATH_TO_CURRENT_PROJECT_DIR" -t:all -progress "PATH_TO_CURRENT_PROJECT_RIBS_DIR/perspShape.0003.rib"
If the value of the second arg is 1 ie. the script is automatically executed in a cmd window (Windows) or a terminal (Linux and OSX). If the vale of the second arg is 0 ie. the user must manually execute the script by double clicking it. The contents of the rib files produced by RfM and be altered using filters written in python. One such filter, implemented by a script named rif_it.py, is part of the zip package mentioned in the RfM 22: Customizing tutorial. The rif_it module changes the Display statement in each rib file so that instead of rendered images being saved as openexr files they are displayed directly in the Image Tool. For example, to apply the filter execute the following command. Multiple rifs can be used. For example, rif_mesh2blobby.py convert all polygonal objects to blobbies if they have been assigned a float primvar named "blobby" - figure 5. 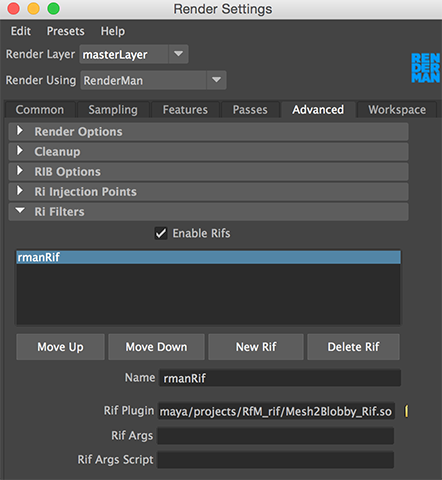 Up to the release of RfM 22 it was possible to specify RifPlugins using a convenient interface that was part of Maya's Render Settings window - figure 6. 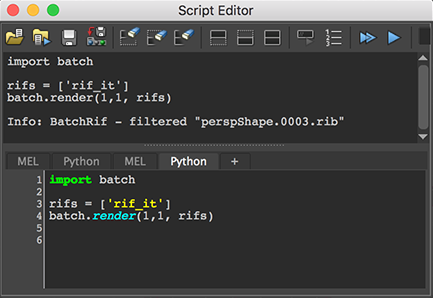 RfM 22 does enable rifs to be used directly - hence the motivation for the python scripts mentioned and presented in the tutorial RfM 22: Customizing. An example of using two RifPlugins is shown next. Note that if a RifPlugin accepts two or more inputs they must be separated by white space NOT by commas. 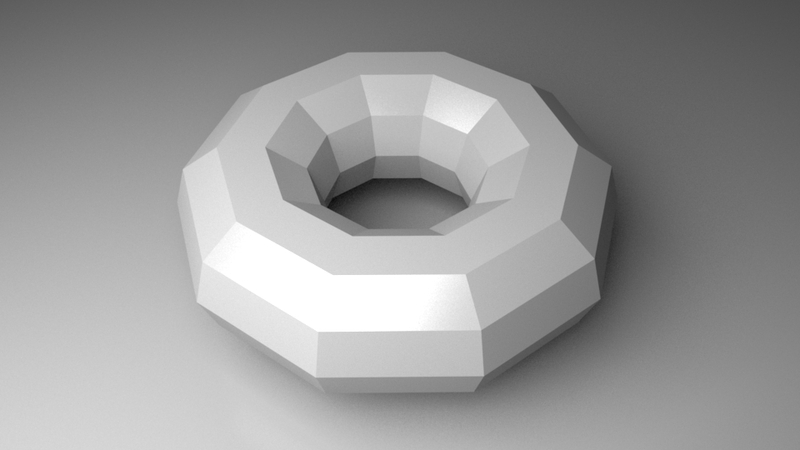 A polygonal torus undergoing a squash deformation. it's vertices have been used to define a RiBlobby.